The Indian Space research Organisation (ISRO) on Monday released images of outer space captured by India's first space observatory, Astrosat. The images of the Crab Nebula, captured by the multi-wave length space observatory, were released on Twitter by Isro. The Crab Nebula, which also includes the Crab Pulsar, is the brightest hard X-ray source in the sky, and is very often used to calibrate hard X-ray detectors. 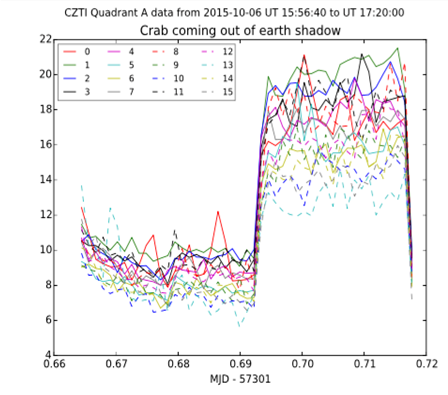 Crab Nebula was detected on 9 October 2015, observed parallely by both Mission Operation Centre at Peenya, Bengaluru and Payload Operation Centre, IUCAA, Pune. The nebula was not detected during Astrosat's first orbit because the satellite 'happened to pass through the South Atlantic Anomaly (SAA) region when Crab was in the field of view', Isro said in a blog post. The SAA, also called the 'Bermuda triangle of space', can produce 'glitches' in astronomical data, problems with the operation of on-board electronic systems, and premature ageing of computer, detector and other spacecraft components. SAA avoidance zone was deliberately kept wide to protect the instruments, and detectors were switched off in this interval during the initial days of Astrosat operation, it added. Isro said its team initially faced difficulties after Astrosat failed to capture the Crab Nebula in its first orbit. 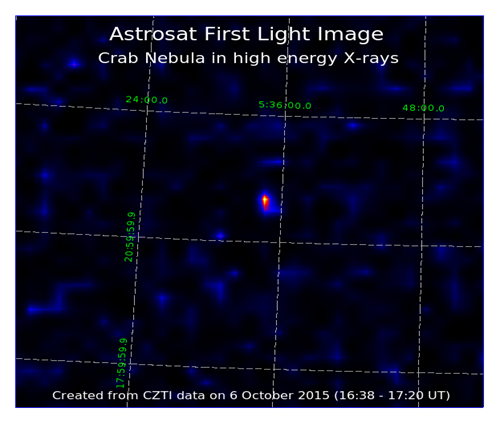 ''A quick look at the first orbit image showed that Crab Nebula was not detected. Most likely, the data pruning was erroneous,'' the blog post said. ''A tense session of self-introspection followed. Questions followed one after the other to explain the strange behaviour. Did the Mission Operation team make any error in orienting the satellite? Well, CZT-Imager has a wide field of view and it is too embarrassing to even pose the question whether they made such a large mistake in pointing,'' it added. But, later on 9 October, the Crab Nebula was finally detected and observed parallely by both Mission Operation Centre in Bengaluru and Payload Operation Centre of the IUCAA in Pune. Isro is now planning to use Astrosat to look at some black hole sources like GRS 1915+105, Cygnus X-1, Cygnus X-3 in November. The space agency said all X-ray instruments (CZTI, LAXPC and SXT) would be made operational in the following month and space observatory will be ready to study other celestial bodies. Astrosat, India's first multi-wavelength space observatory was successfully launched by ISRO's workhorse launch vehicle PSLV into a 650km orbit on 28 September 2015. ISRO has since put its payloads into operation. The Charged Particle Monitor (CPM) was the first payload to go operational followed by the Cadmium Zinc Telluride Imager (CZTI), the hard X-ray detector on board Astrosat. CZTI was made fully operational on 5 October 2015. Then, on 6 October, Astrosat was oriented towards Crab Nebula, remnant of the Supernova detected by Chinese astronomers in the year 1054. Isro is now among a select group of space organisations that have a lookout in orbit, after the US, Japan, Russia and Europe. The launch of the Astrosat came just a year after Isro's first interplanetary mission, Mangalyaan, entered the orbit of Mars. Astrosat, India's first Multi-wavelength Space Observatory was successfully launched by ISRO's workhorse launch vehicle PSLV into a 650km orbit on September 28, 2015. Then began the process of putting each of the payloads into operation.The Charged Particle Monitor (CPM) was the first payload to go operational followed by the Cadmium Zinc Telluride Imager (CZTI), the hard X-ray detector on board Astrosat. CZTI was made fully operational on October 5, 2015. Then,on October 6, Astrosat was oriented towards Crab Nebula, remnant of the Supernova detected by Chinese astronomers in the year 1054. The Crab Nebula, which also includes the Crab Pulsar, is the brightest hard X-ray source in the sky, and is very often used to calibrate hard X-ray detectors. Crab Nebula was detected on Oct 9, 2015, observed parallely by both Mission Operation Centreat Peenya, Bengaluru and Payload Operation Centre, IUCAA, Pune. Figure 4: Image of Crab Nebula in hard X-rays above 25 keV. 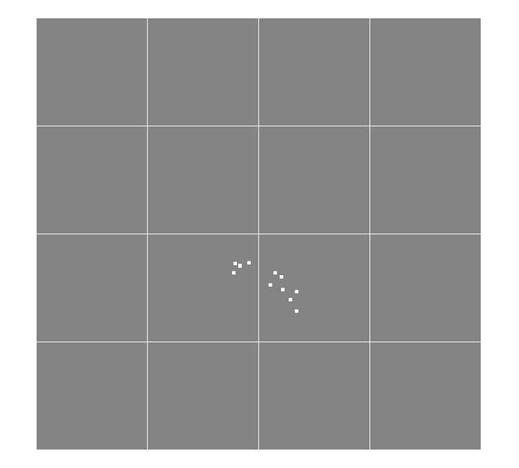 The bright spot near the centre indicates Crab. The effective imaging resolution here is about 10 arcmin. The faint patches outside are `side-lobes’ of the imaging process and they will be suppressed significantly when data from all quadrants are analysed simultaneously, which will also improve the image resolution to better than 8 arcmin.